OnBoard Tours is excited to announce that we have been selected as this year’s Official Bus Tour of the National Cherry Blossom Festival! Take the DC The Blossoms! Tour. Can you imagine being surrounded by blooming cherry trees with our precious National Monuments all around you? This is the best way to enjoy the flowering trees in Washington DC, and it will create an experience you will never forget. The best part is that your tour guide will hop off the mini-coach with you to guide you through the traffic to the best spots to take pictures from. The guide will also give you in-depth explanations of the history of the Cherry Trees and the monuments around the tidal basin as well. The other guys leave you on your own, or narrate your tour with a recording. We use the best live tour guides in Washington DC. We have selected the best vantage points from which you can view the blossoms and take fantastic pictures in a quick and efficient tour. 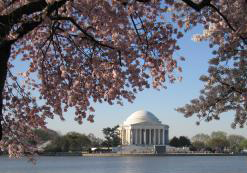 If you want to see the attractions in more detail, and you are interested in a boat cruise to see the blossoms along the Potomac River, we recommend the DC It All Tour. However, if you have limited time in Washington and want to see a few of the monuments and get the best views of the blossoms, this is your tour! The US Capitol — Walk through Lower Senate Park to see the pear tree blossoms. The White House — Quick photo stop. The Old Post Office — Starting point of the tour. FDR Memorial — On the walk around the Tidal Basin. Jefferson Memorial — On the walk around the Tidal Basin. Martin Luther King, Jr., Memorial — On the walk around the Tidal Basin. World War II Memorial — Fantastic view of the Jefferson Memorial with trees in the foreground. Washington Monument — Take amazing pictures from the Tidal Basin. Canadian Embassy, Smithsonian Museums, National Archives, Lincoln Memorial, and More! ← Previous Previous post: Pawn Stars The Tour?? ?